INDIANAPOLIS - Venerable Grand Prytanis Christopher T. Hanson (Alpha-Pi, George Washington) is proud to announce that Zain Islam (Upsilon-Mu, N.Y.I.T.-Manhattan) has been selected Chairman of the Collegiate Advisory Committee. Frater Islam succeeds Frater Patrick Diehr (Gamma-Kappa), who resigned earlier this year due to personal outstanding responsibilities. The Collegiate Advisory Committee Chairman is an At-Large member of the Grand Council and his vote represents the voice of the collegiate members. 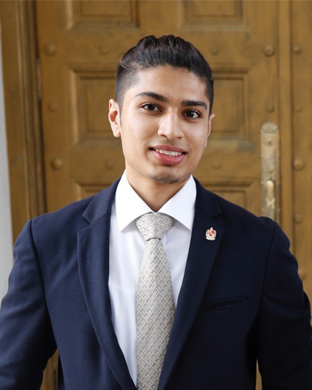 Frater Zain has served his chapter as Histor, Epiprytanis and Prytanis, while majoring in Computer Science. Throughout his time as a Teke, he has attended multiple Regional Leadership Conferences and Province Forums, as well as attending Conclave 2017 in New Orleans. “I am very fortunate for the support and resources I have gained, and continue to gain, from this Fraternity. I want everyone in TKE Nation, active and alumni, to have a positive experience even greater than mine. And, with that mentality, I look forward to leading this committee in accomplishing our goals. It is an honor to serve you as the Collegiate Advisory Committee Chairman for the 2017-2019 Biennium,” shared Islam. Additionally, due to graduations, the TKE Collegiate Advisory Committee is seeking to fill five spots for the 2018-2019 academic year. The search begins immediately and Tau Kappa Epsilon would like to congratulate these Fraters on their graduation and thank them for their dedicated service to TKE - John Bjerkness (Epsilon-Alpha, Saint Louis), Timothy Cucci (Epsilon-Beta, Tampa), Patrick Diehr (Gamma-Kappa, Indiana), Madison Smith (Tau, Oregon State) and Zach Woodbeck (Epsilon, Iowa State). If you are interested in being considered as a new member to the Collegiate Advisory Committee, please apply at www.tke.org/cac to serve the Fraternity as an advisor to the Grand Council and Professional Staff. Applications are due August 17, 2018 at 11:59 pm pacific for review, with candidates slated by the Chief Executive Officer and final approval confirmed by a vote of Past Grand Prytani.